The article with this picture. "Where do you buy your diapers? And I've heard that the clothe diapers do require you use more water and therefore they aren't as environmentally friendly..."
I think I answered her first question with my second post. But, I am devoting this post to her second question/suggestion. 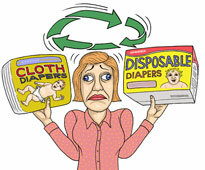 The question I'll attempt to answer today: Are cloth diapers really more eco-friendly than their disposable counterparts? My answer (and opinion) in a nutshell: Cloth diapering can be dramatically more eco-friendly - depending on how you do it. "Disposable diaper users: you make a lot of trash. Cloth diaper users: you use more water. Landfill space vs. Water Use - both are detrimental to the environment, so it doesn't really matter which one you choose."
. . . no dirty diaper (or "nappy," as they're known in the U.K.) is impact-free. The water and energy required to wash and dry cloth diapers also take their toll, particularly as energy resources become strained. "The most significant environmental impacts for all three nappy systems were on resource depletion, acidification and global warming," the authors concluded. "For one child, over two-and-a-half years, these impacts are roughly comparable with driving a car between 1,300 and 2,200 miles." Ok, I'll buy that! But I'm not about to let my 3-month old infant roam around diaper-free, or stop having babies to reduce my environmental impact. IMO: THAT would be ridiculous. But to continue the discussion . . . The 1990's study is largely contested by reusable diaper advocates because it was commissioned by Proctor & Gamble - the largest manufacturer of disposable diapers (conflicting interest perhaps?). The 2004 British study has been contested on the grounds that the sample size of cloth diapering families (117) was too small in comparison to the 2,000 disposable diapering families, largely gathered data from those who used terry cloth diapers - which take much more water to wash. It also assumed that the diapers were washed at high temperatures with an agitator-style washer at home. Some articles have mentioned that it was not accounted for that cloth diapers can be used a minimum of 75 times, and only take an average of 6 months to decompose in a landfill vs.500 years. So, what do we learn from all that mumbo jumbo? If inefficient cloth diapering is just as bad for the environment, then more efficient cloth diapering is easily better for the environment! Our cloth diaper stash drying after a wash.
Sun dry your dipes on a clothes line or drying rack - free eco-friendly energy! Sun drying also naturally bleaches the diapers for some anti-microbial benefits. (Tuscon is going to be a great place to be cloth diapering for this reason - I expect we'll never have to dry our diapers in the dryer again.) HE dryers would also be helpful. For washing, use an energy efficient washer OR a diaper service. Both of these options use a great deal less water than the old school agitator washers do. Use detergent that rinses clean (Rockin' Green) - you won't have to strip your diapers as often. The temperature at which you wash your diapers also affects how environmentally friendly your cloth diapering is. I always wash mine on a cold/cold cycle - which also protects the nylon Gliners from stretching and and causing leaks. If you're going to use disposable inserts, compost them in your backyard. The flushing uses a lot of water, and putting them in the dump means they won't get enough air to decompose and they'll be contributing to landfills as much as their plastic disposable counterparts. I hope that answers your question, Suzy! Hey Jaime- so I had a friend who cloth diapered and I wasn't able to have her wlak me through the whole process. But I toyed with the idea of CD when I had Piper, but felt really overwhelmed. I've been reading your posts about it and I'm thinking that I'd like to try it. You say you'd go the whole g diapers route- which I researched with Pip. Are there anyother brands you'd recommend? and have you ventured into making your own stuff?